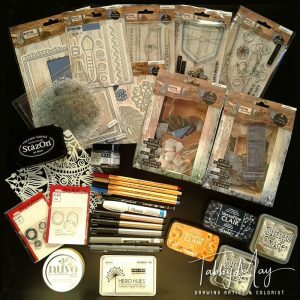 Earlier this week I’ve shared my unboxing video with you, with my new craft supplies. 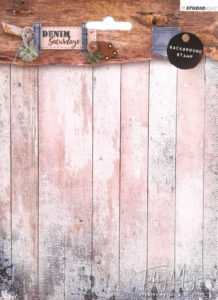 Today I’ll show you my first layout, made with several items of the Studio Light Denim Saturdays collection. Wow, this collection is really C-O-O-L… in capitals! Another ‘problem’ was the overload of choices. I really had to think ‘what will I use this time?’, since there is SO MUCH to choose from! But it unfolded gradually and I think this layout turned out really good. I’m happy with it! Like I said, I started unconventional with the background card of one of the background stamps. First I used a die cut for the shape of the layout. When I saw this shape for the very first time, used by someone in one of the creative Facebook groups, I thought they had just torn a piece of paper out of a ring binder. But then I realised it was done with a die cut! I instantly loved it. And now I’ve got it, lucky me! I continued with blue Versafine Clair ink, using it with the fabric pattern background stamp. When that was dry I added some yellow Nuvo embellishment mousse on top of that. 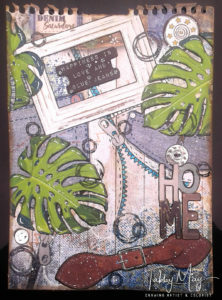 I covered the stamped background with the AALL & Create stencil that I received this week. Then I added some orange stitches, using Versafine Clair ink again. To cover the black circle in the right top corner (saying ‘background stamp’) I took a piece of Clairefontaine Paint On paper. I drew a circle and cut it out with scissors. Then I put some silver gilding wax on top of the circle and then I stamped a button on it with Stazon ink. The ink didn’t look as black as I wanted, so I used a black Staedtler fineliner to trace it once more. After that the stamped image was perfect. With a gold metallic Faber Castell Pitt Artist pen I colored the stars and the tiny circle in the middle. I glued the button to the black original circle and all that’s left now is a black shadow-like frame. Then I took my Sizzix Big Shot die cut machine and cut out a couple of Monstera leaves, with one of the Denim Saturdays dies. 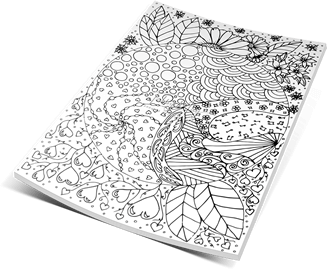 The paper I’ve used for this came from a patterned paper pad I bought at Lidl and coincidentally it contained nearly the same size Monstera leaves. This gave me the perfect leaves with nerves and all! After that I took some glossy metallic paper and cut some nice and shiny buttons. With the blue Versafine Clair ink I also stamped backpockets and cut them out with scissors. The part I was looking forward to the most, was the cutting of the tiny buckle from the glossy metallic paper. And that worked out exactly as I hoped. It looks like it’s real metal! For the belt I’ve used a sheet of brown paper from the Studio Light Denim Saturdays Paperpad 104. Because of the color and the print it looks like leather 😀 . I could go on for hours telling how I did everything, but I’ll cut it short. Not for me, I don’t mind telling it in detail, but for you, because it will become a very dull and uninteresting story I’m afraid. Next time I’ll turn on the video camera and film it all. Image says more than words, right? Okay, in short… I stamped zippers and colored the teeth with a blue Stabilo Point 88 fineliner, a black Staedtler fineliner and a white Sharpie. For the tabs of the zippers I’ve used a silver metallic Faber-Castell Pitt Artist pen. On the back pockets I’ve colored buttons with the Faber-Castell metallic Pitt Artist pens in copper and silver. 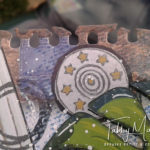 I stamped circles with Crealies stamps in white (Hero Arts) and black (Distress Oxide) ink and I’ve added a text and a frame from the Studio Light Paper elements. 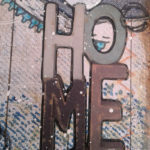 Between a back pocket and the belt, on the lower right side, I’ve also added the word ‘Home’. This too came from the Paper elements. 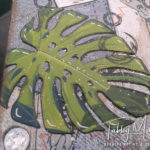 Finally I glued the Monstera leaves and added highlights and spatters with the white Sharpie. 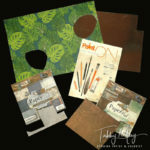 For the edges of the layout I used the Tim Holtz paper distresser. The finishing touch was to give the edges some color with Distress Oxide Walnut Stain, for which I used a blending tool. Only thing I had to do after that was take pictures. I’ve put all the pictures of the details in an album, which you can find by clicking HERE (opens in a new tab). The album also contains the larger pictures of the ones that are already displayed in this blog. Right below I’ll show you the end result anyway 😉 ! If you liked this blog and layout, then please click the social buttons below and share. Your help is much appreciated in helping me grow my audience! You can also follow me on Facebook, Instagram, Twitter, Vimeo and YouTube. Thanks for stopping by and see you next time!